On December 22nd 2010, Ms. Sachiko Yamano, Vice President of JICE, Mr. Kazuhide Kimura, Director of Overseas Business Department of JICE, and Ms. Yukari Iizuka, Director of Hokkaido Office of JICE, visited the People’s Association for Friendship with Foreign Countries of the People’s Republic of China (hereinafter referred to as “China”), and concluded a memorandum regarding the friendship cooperation in Nanjing, the capitol of Jiangsu Province, with 76.3 million population. 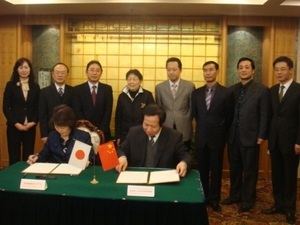 On the same day in Nanjing, we held a formal signing ceremony with Mr. Wu Xi-jun, Chairman of the People’s Association for Friendship with Foreign Countries of China, and other parties (from Agency for Hygiene of People’s Government, Agency for Education, Jiangsu Agricultural Committee, and Agency for Pro-Environment in Jiangsu Province) as witnesses, to conclude a memorandum between Mr. Xu Long, Vice Chairman of the People’s Association for Friendship with Foreign Countries of China, and Ms. Yamano, Vice President of JICE. This memorandum refers to a long-term cooperation in terms of mutual visits, training by experts, human resource development, technical cooperation, and exchange among young generation, especially in the fields of medical hygiene, agriculture, pro-environment, and education in Jiangsu Province. From December 21st to 22nd 2010, they visited Yancheng City of Jiangsu Province, and met with Mr. Cao You Hu, Deputy Mayor of the City. They held a social meeting with the parties related to the People’s Government of Yancheng City. Parties from Yancheng City mentioned that they were hoping to work closely with JICE through Foreign Affairs Office of Yancheng City. Regarding the exchange opportunities for junior high school and high school students, we agreed on maintaining the project, and exchanged views on the improvements that were required. From the Yancheng side, we were told that they would draw out plans more specifically on how we were going to cooperate with each other by the beginning of next year, and confirmed our respective roles. Now that we have visited Yancheng City, we are looking forward to deepening our ties with Yancheng City hereafter.